Rasam is an indispensable dish in the south Indian families. Many would have savoured the delicious rasams prepared in eeya chombu . The eeya chombu is a pot made of lead. Some say it is made of tin. My brother says it is an alloy**! Eeya chombus were an integral part of a bride’s trousseau. Ladies would treasure these vessels, and pass them on through generations like family heirloom! Rasam was typically prepared in these eeya chombus using the kumti which is small iron choolha that uses charcoal fire. One should know the technique and be careful while making rasam in an eeya chombu. It is not unusual (and very expensive!) to find new comers melting the rasam pot over their gas stove! If the pot is left on the fire unattended, it can simply melt in no time! We hear a lot about lead poisoning and other metal toxins in recent times. But it is amazing to see the old people who used to eat food cooked in brass vessels plated with kalai or lead are still leading a healthy life. The use of brass and lead vessels have certainly declined after the advent of ever silver steel vessels. These in turn have become less popular after the nonstick items and glass vessels invaded the market. With all this evolution or revolution, I still have relatives who insist on having eeya chombu rasam. Eeya chombu or not, here is a rasam with the unique flavour of coconut milk which will surely entice any rasam lover. 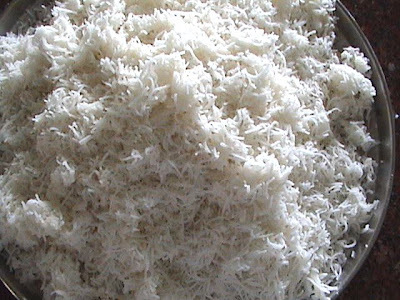 Three extracts of coconut milk from 2 cups of freshly grated coconut as described below. a) Use 2 cups of freshly grated. Grind the fresh coconut gratings in as little water as smooth as possible. Use a strainer and squeeze the mixture to extract the milk. This is first and thickest extract. b) Add more water and grind the coconut again and extract milk the second time. Keep this more dilute second extract separately. c) Follow the same process and extract milk the third time, this will be really dilute with hardly any coconut milk left, but this will come into use as well. 1.Dry roast, pepper and cumin seeds. 2. Roast the rest of the ingredients in a drop of oil. 3. Make a smooth powder with all the roasted ingredients. 1. Soak tamarind in water and leave it aside. 2. Pressure cook tur dal with a pinch of turmeric powder and water. 3. Extract the juice of tamarind. 4. Add the most dilute or the third extract of coconut milk to the tamarind juice. 5. Add salt and the rasam powder and boil until the raw smell disappears. 6. Add cooked dal, curry leaves and the second extract of coconut milk and boil vigorously. 8. Finally, add the thickest or the first extract of coconut milk and decrease heat. 9. Add finely chopped coriander leaves and wait till the rasam foams. 10. Switch off flame before it starts boiling. 11. Season mustard seeds in a spoon of ghee. Relish the coconut milk aroma as you slurp it down with hot rice. Note: A thumb rule for tasty rasam is that it should never be boiled, as it spoils the flavours. It should be switched off, just as it foams rises to the top of the vessel, quite similar to milk. A tight lid should be used to immediately cover the rasam, to seal in the flavours. This image below shows a long unused eeya chombu ; a kumti, which we took out from mothers attic, to take a photo for this post. As you can see my nephews even started a small fire in the kumti! We did not actually cook using these vessels, since they have been unused for a very long time! 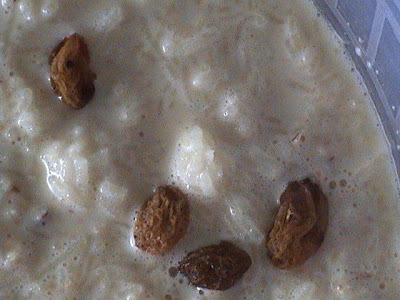 My sister-in-law still actively uses her eeya chombu, and has sent in the photo shown above in the recipe. ** Disclaimer: The authors of this site do not claim knowing about the metallic composition of eeya chombus, and neither the impact of using eeya chombus on health! A google search on eeya chombus reveals many aruguments on what is the metallic composition of eeya chombus! Some say its lead, some say its tin, others say it an alloy. One view says it was originally tin, but unscrupulous manufacturers sold pots adultrated with lead for several years, and therefore a common and wrong notion that it is lead! Pichu Pati was a cooking wizard! She could efficiently cook a feast for a hundred people without any noise or fuss. She was a very slender and short lady and her deftness and speed was unimaginable. Whenever there was a feast at home, Pichu Pati was summoned for help. It never seemed as if she was hired help for the day, as she did her job with great devotion and love for our family. She had taught mother her trade secrets and had given her many of her hit recipes as well. One such recipe is making fluffy and marvelous Aval Dosai. Mother has been preparing this dosa ever since. During one of our picnic outings to a nearby bird sanctuary (it was not buzzing with crowds, like it is in the present days) mother prepared hot aval dosais under the shade of the tall trees on the banks of the river. Though packing up the gas stove, the batter vessel, the tava and other knick-knacks was a wee bit of work, the experience of eating dosais, as we enjoyed the beauty of the gurgling river and the babbling of the fledglings in the bushes, is etched indelibly in our memories. 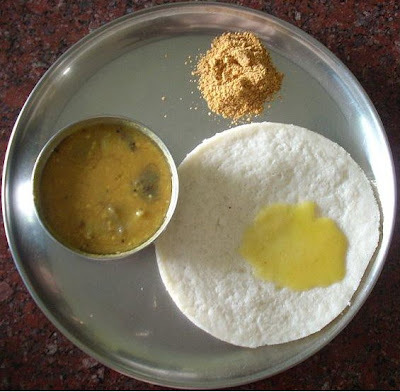 The photo below is of the aval dosai prepared by my mother during a recent visit. 1. Soak rice and beaten rice for half an hour. 2. Grind them into a smooth batter adding sour curd in the end. 3. Mix in the salt and leave it in a warm place to ferment. 4. It takes at least 12 to 15 hours for the batter to rise. 5. When the batter is ready for use, heat a tava and rub it evenly with a drop of cooking oil. Using a halved onion to rub oil on the tava yields good results. 7. Once the tava is heated decrease the heat and pour one ladle of batter on it. 8. Help the batter to spread into a thick round dosa without applying too much pressure. 9. Dribble a little oil around the dosa and cover it with a lid. 10. Turning over is not necessary. 11. The dosa will look like a honeycomb with its numerous holes when cooked. Enjoy with sambar or chutney or molaga podi or a vegetable korma. Kids love it drizzled with honey. Do not forget to top it with a fresh blob of butter. It was my birthday eve last month – my 60th birthday. Mother was narrating the story about how father had specially ordered for coconut-sized laddoos for my first birthday, and how the palace was incidentally illuminated on that evening, and how the house was bustling with relatives, and how excited they were when they remarked that the palace was illuminated for the Maharani’s (meaning myself!) birthday and the story went on and on and on. Though we had heard this story a thousand times, we listened to her with rapt attention as we gazed at the star lit sky to see if we could spot a satellite or an U.F.O, just as we did decades ago. We sat around the circular cement fish pond in the large garden, chatting, laughing and remembering those good old days. We were pulling each other’s legs and shared our stories with our next generation. The white egrets looked like a string of pearls as they flew in the dusky sky. There was a ripple in the pond as the fish swished by. A friendly owl hooted from the nearby Ashoka tree. The fragrance of the Jaji flower filled the cool breeze. Nothing had changed at my mother’s place except that father was no more, and my kid brothers had taken up the reins of the household. Though the four of us siblings have branched off into four different families, the same old pranks, and our togetherness resurfaced with the same excitement, just the way it did whenever we got together. This time we got together at mother’s place since my brothers decided to perform a mammoth homam for the welfare of the clan on my 60th birthday. 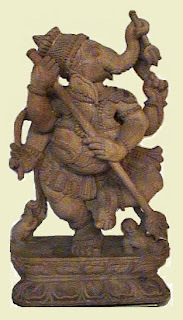 hour for the vaadyars (priests) to prepare the Homa Kundam (The altar where ghee and rice was to be offered to the deity through Agni or the Fire God), and get the other articles in place. One of them drew the Lalitha Yantram using coloured rangoli powder. Lailta is the cosmic power or the Goddess who creates, sustains and finally engulfs the universe. Yantram is a geometric diagram which represents the deity. The diagram, especially its angles, is supposed to attract positive energy. The vibrations produced by the sound of the mantras, drive away all negativity and fill the space again with positive energy. The fumes arising from the Homam purifies the home and the entire atmosphere, since specific medicinal dry twigs (Sammith) are used for the purpose. All in all Homam is said to purify and heal the body, the soul and the mind. and eight names of The Goddess were recited, as the vaadyars made offerings to the fire. My brothers and my husband joined them in the offering while the rest of us assisted them. Mother at 78 years, was running around with great zest and cheer. The youngsters clicked away photos and also managed to run on errands. The clanging of the vessels and the aroma of food cooking in the courtyard competed with the sound of the Mantras and the aroma of the fumes arising from the Homam. a delicious rasam, papad and pickle, along with steaming hot in the center of the leaf; The special sweet of the day was Obbattu, and finally curd. The boys started an obbattu eating competition when they took ‘good care’ of each other. Some had it with ghee and the others had it with hot milk. I remembered my mother-in –law who loved this sweet. She prepared it on all occasions as long as she lived. I used to assist her by cooking it on the tava as she patted out one after another obbattu on a banana leaf. After returning from my mother’s place I could not resist my urge to prepare obbattu all by myself at least once. It was not a bad try and this is how I prepared it. 2. Cook it in just enough water till tender but not mushy. 3. Throw away excess water if any left , and allow it to cool. 4. Grind dal, coconut gratings and jaggery adding the cardamom powder. 5. It will become like chapatti dough. 6. Keep this Poornam aside. Mix all ingredients and knead into a dough using little water. The dough should not stick to your hands. Allow it to stand for half an hour. The more it is allowed to soak the more elastic the dough will be. 1. Take a lump of dough and roll it into a lemon sized ball. 2. Flatten the ball and place a ball of the sweet filling in it. 3. 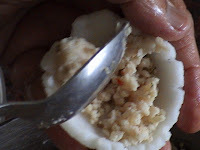 Bring the edges together and make a ball again so that the ball of poornam is inside the dough ball. 4. Grease a banana leaf and your fingers too. 5. Place the prepared ball on the leaf and pat it evenly on the leaf giving it a round shape as thin as possible. 6. Heat a tava and invert the banana leaf on it, peel out the raw obbattu on to the tava / pan. My husband relished it with milk while I savored it with ghee. Bless the obbattu hang over! Idli is omnipresent in South India. Some find it difficult to understand the craze behind this unassuming white cake made of rice and lentil. But nothing like good soft white steaming idlis with a little sambar, chutney, or molagai podi with a little ghee or sesame oil, anytime, anywhere! Idli finds itself easily fitting into grand breakfast menus at festivals and weddings, as well as in the diets during convalescence. It is steam cooked, easily digestible, rich in B vitamins, and fat free (when eaten without accompaniments, of course!). Idlis are a boon to travelers carrying their meals, and have a long way to go. Its easy to handle and not at all messy! Idli brings back some memories of our travels in the 1950s. Once, after a hectic South India tour we landed unannounced at our relative’s place in the middle of the night, as it was not safe to cross over the Dimbam ghats in the dark. Our hospitable and generous grand uncle made the neighbouring shopkeeper open the stores, and bought bread and bananas to satiate our hunger. At the crack of dawn, the ladies of the house were very glad to pack idlis for the last lap of our journey towards home. Luckily, they had ground the batter the previous day! 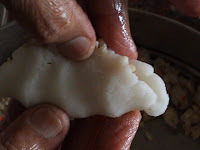 The idlis were packed in banana leaves, which were greased and lightly heated over flame to make them pliable. The banana leaf parcel was then packed with a layer or two of newspaper, and tied with white thread. After driving for a couple of hours, father stopped by a mountain stream for breakfast. Mother opened the efficiently packed green parcel, and served the idlis on cut banana leaves that were thoughtfully kept in our basket. We hopped on to the rocks that popped out of the stream, and dangled our feet in the freezing cold water as we tucked in the luscious idlis soaked in molaga podi and gingili (seasame) oil. Those were the days when dacoits and forest brigands were unheard of. Father assured our worried mother that the pachyderms and wild animals which she was scared of, would attack only when provoked, or only when they were attacked. Father had taught us how to behave in a forest, and we quietly enjoyed Mother Nature’s bounty listening to the sounds of the forest opening our mouths only for idlis! Decades later, idlis continued to be a staple, and we discovered the the joy of Tattae Idli. Tattae means plate in Kannada. Idlis that are steamed in plates, rather than the traditional idli stands are known as Tattae Idlis. My husband, came across an eatery that even calls itself “Tattae Idli Hotel"at Kyatasandra near Tumkur, Karnataka, during one of his work tours. He became an instant fan of the steaming soft white discs served with a simple watery potato curry seasoned with whole green chillies. Once, realizing his work in Tumkur was almost complete, and not wanting to miss out on these idlis, he purchased a tattae idli stand. 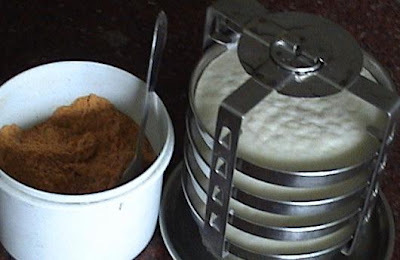 Since then I have also started preparing tattae idly at home. I usually serve it with two varieties of chutneys, sambar and a dollop of fresh melting butter on top. One Tattae idly is equivalent to three normal sized idlis and hence two of them are more than sufficient for the two of us for a wholesome meal. The highway eateries that serve idlis are a boon to weary travelers. It is not only filling, but can be safely eaten without any fear of harm to health, as it is steamed and served piping hot. 1. Soak rice, dal, beaten rice and fenugreek seeds together for half an hour. 2. Grind all ingredients into a smooth and thick batter. Add salt and blend. 3. Fill ¾ of a large vessel with the batter, cover it and leave it to rise for 12 hours. 4. When the batter has risen up to the brim of the vessel, it is ready to use. 5. Grease each Tattae or Plate of the idly stand with a drop of ghee. 6. Fill the plate up to half its height allowing the remaining space for the idly to rise. 7. Place the stand in a pressure cooker and steam without the weight for 15 minutes. 8. Allow the steam to settle down then open the cooker. Remove the idlies from the plates using a knife or a spoon. 9. Enjoy with varieties of chutneys and sambar not forgetting to top it with a dollop of fresh butter or ghee. My mother was the first one to introduce mixed vegetable salad in our home. Nutritional tips were rarely published in news papers and magazines in those days. After reading one such rare tip, she decided to serve us kids a nutritious health dish almost every day. She artistically cut carrots, cucumbers and tomatoes and just added a dash of salt to it. The new dish was really the center of attraction on the table. The traditional version of salad is the kosumbari or kosumalli which has its place in grand feasts. Actually two types of kosumbaris, salted and sweet are a must in feasts. Green gram dal and cucumber are used to prepare the salted version and Bengal gram dal and coconut are used for the sweet kosumbari which is sweetened with jaggery or sugar. Caterers are becoming more and more innovative now a days. Sweet corn, pomegranate, sprouts of various grains and various other raw vegetables have found their place in the making of kosumbaris. Here is a recipe for the colourful carrot kosumbari. 1. Soak green gram dal in just enough water for half an hour. 2. When the dal is well soaked and soft, drain it well and keep aside. 3. Peel and grate the carrots and add it to the drained dal. 4. Heat oil and add asafoetida and mustard seeds. 5. When the mustard splutters add the cut green chilly and the broken red chilly. 6. Add the seasoning to the carrot and dal mixture. 7. Add salt, juice of 1 lime and shake well in a covered vessel. 8. Garnish with fresh coconut gratings and fresh coriander leaves. This is also a good after school snack for children. When eating the same rasam prepared with tamarind daily becomes boring, and the tongue craves for variety, we usually switch over to tomatoes or lime or even mango or pineapple to add the sour taste to rasam. Lime rasam can be had as a clear thin soup just before meals, or served like any other rasam with white rice. 1. Pressure cook green gram dal in 1 ½ cups of water and turmeric powder. 2. Add salt, asafoetida, curry leaves to the watery cooked dal and boil for 2 minutes. 3. Add chopped tomatoes and boil for one more minute. 4. Add two glasses of water and decrease heat. 5. Coarsely powder pepper and cumin seeds and add it to the rasam. 8. Wait until the rasam foams and remember to remove from flame before it boils. 9. Heat ghee and add mustard seeds. When it splutters add it to the rasam. 10. Keep the rasam covered so that the flavour is intact. TIP: Any rasam should never be boiled as it spoils the flavours. Rasam will foam, and slowly rise to the top of the vessel, similar to milk, when it reaches boiling point. The flame should be switched off immediately, and the vessel covered with a lid to seal in the flavours. Enjoy the hot Lime Rasam in a tall glass as you watch the monsoon rain lashing out. Today is Ganesh Chaturthi. Lord Ganesha is the remover of obstacles and the Lord of New Beginnings! Wish you all a very happy and successful year ahead with Lord Ganesha’s blessings! Lord Ganesha is said to love sweet kozukattai or modak, which is a steamed dumpling made of a thin rice flour shell, filled with a delicious mixture of coconut and jaggery. Somasi is a similar sweet, which is however, deep fried rather than steamed. The outer covering is made of maida (white flour) and rava (semolina). The mixture inside is made of cobri (dried cocunut) and sugar. 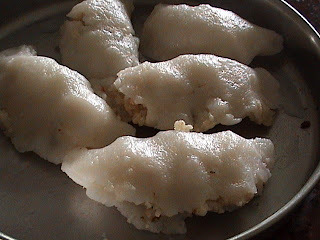 Ulutham Kozukattai is a salty steamed dumpling, that is also usually prepared during festivals and is offered to the deity worshipped. Like the sweet version, this also has an outer shell prepared with rice flour and a stuffing prepared with lentil. As Ulutham Kozukattais are very nutritious, my mother used to prepare them as an evening tiffin. She even enriched the nutritional value, by adding some minced vegetables. We would pop them into our mouths as we went up and down and finished them off, even before they were served at the table. A spicy gojju or a chutney will make a delicious combination with Ulutham Kozukzttai. Given below are recipes for the sweet as well as salty Kozukattais. 1. Boil water with salt and oil in a thick bottomed pan. 2. 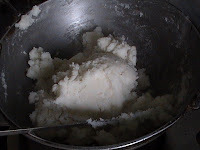 When the water is boiling add the rice flour gently stirring continuously to avoid lumping. 3. When the flour is cooked and becomes a mass, turn off the heat and cover it with a lid leaving it for 5 minutes to cook in its own steam. 4. Knead the cooked flour into a soft dough adding a little oil if necessary. 5. Take a small portion of the dough and roll it into a lemon sized ball. 6. Dip your fingers in oil and then make a depression in the middle of the ball with your thumb. 7. With both thumbs in the depression, press the edges extending them with the other fingers to make a cup like shape as uniform, and thin as possible. 8. Place a spoonful of the filling into the cup and fold the cup in half so that the edges are sealed. 9. Press the sealed edges making sure that no stuffing comes out, and you have plump semi -circular shaped dumplings. Alternately, you can gather the edges to the top and squeeze them together with your finger tips, to resemble the shape of a top or garlic pod! Note: If you make both sweet and salty types for the same meal, then I would recommend different shapes (semi circular for the ulutham kozukattai, and top-shaped for the jaggery-coconut kozukattai) for easy identification! 10. Shape all the kozukkatais in the same manner. 11. Steam the whole batch in a pressure cooker without weight for 15 minutes. 1. Mix coconut gratings and jaggery and cook in a heavy bottomed pan, over a low fire, stirring occasionally. 2. When the mixture is ready, it will leave the sides of the pan. 3. Switch off the flame, and add cardamom powder if desired. 1. Soak dal and red chillies for half an hour. 3. Steam the ground dal for 15 minutes, and set aside. 5. When it splutters add finely chopped vegetables and a pinch of salt and sauté. 6. Next add the steamed dal and crumble and mix with the vegetable and seasoning. 8. Stuffing for Ulutham Kozukattai is ready. 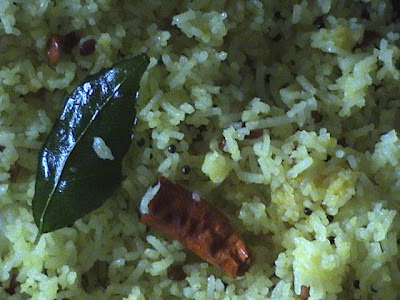 Ulutham Kozukattai can be enjoyed with any chutney or gojju.